There is very strong evidence that tyrosine kinases are involved in the growth and metastasis of prostate cancer (65,152,165). Tyrosine kinases also play key roles in modulating tumor sensitivity to radiation- and chemical-induced apoptosis. 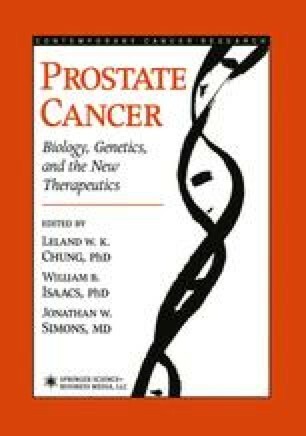 Thus, there is hope that they may play an important role in the response of metastatic prostate cancer to hormonal intervention as well as to other chemotherapeutic approaches (78). Their potential importance as targets for intervention is indicated by the FDA approval of the HER2/Neu-directed therapy, Herceptin, for breast cancer therapy and current clinical trials investigating its effectiveness for prostate cancer (140). Presently, because of screening, 80% of prostate cancers are found while still localized to the gland. If we had the ability to determine which cancers would not metastasize, treatment could be given on an individual basis. Presently, prostate specific antigen (PSA) and tumor grade are the best markers we have. While being generally good clinical indicators, they lack specificity for the individual patient. There are a number of indications that tyrosine kinases may be valuable as prognostic markers in these situations (65,152,165).